Essentials of ABO-Rh Grouping and Compatibility Testing: Theoretical Aspects and Practical Application focuses on overall safety in blood transfusion, including accurate ABO and Rh-D grouping of both patient and donor. The book first elaborates on the ABO blood group system and the Rh blood group system and hemolytic disease of the newborn. Discussions focus on the Rh-D antigen, Rh genotyping, Rh testing of blood donors and recipients of blood, antenatal and postnatal serology in cases other than Rh and ABO hemolytic disease, selection and preparation of Rh anti-D grouping reagent, dangerous group O donor blood, alternative sources of anti-A and anti-B blood grouping reagent, and development of the A and B red cell antigens. The manuscript then takes a look at compatibility testing (crossmatching) and transfusion reaction investigations, as well as compatibility testing and preparation of blood for patients with antibodies to serum proteins; compatibility testing of patients with known irregular antibodies; non-urgent compatibility testing of blood; and compatibility testing for patients requiring platelets. The publication takes a look at practical procedures, including grades of agglutination, control of anti-human globulin serum, preparation of low ionic strength saline, and preparation of platelet concentrates. 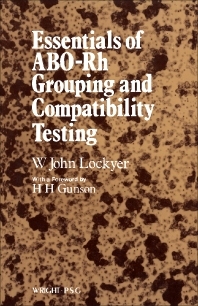 The text is a valuable source of information for researchers interested in ABO-Rh grouping and compatibility testing.